Thailand, particularly Bangkok, is definitely a paradise for all shopaholics. The massive, modern, multi-storey shopping malls provide a myriad of choices for every budget and need. The only problem you must face is deciding where to go first because of the infinite shopping possibilities! But with a map and a dose of style-savvy, you are good to go! Thailand is renowned all over the world for its beautiful silk, jewelry and original exquisite handicrafts. It is also known for producing first-class fake goods. From the most luxurious to the cheapest—clothing, shoes, bags, apparels, jewelry, to branded luxury goods and even electronic devices such as mobile phones and laptop computers, you can find almost anything of your fancy here. 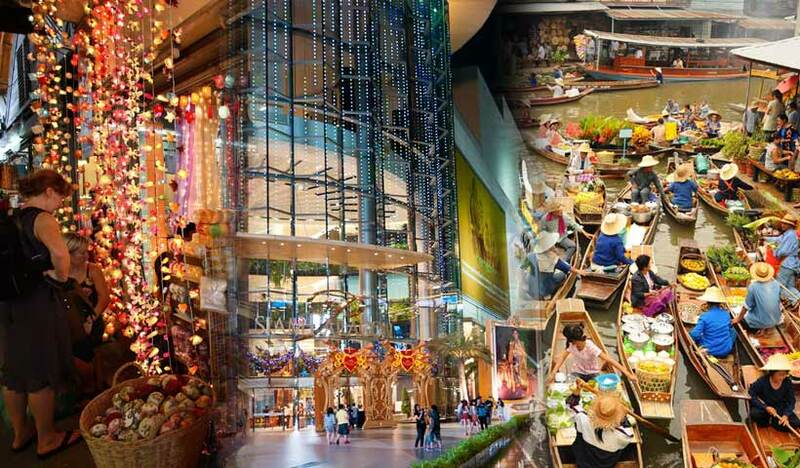 In Bangkok, you can choose among a wide variety of Shopping malls and open-air markets. Like other big cities, shopping malls & department stores are places where you can but high quality products. Though there are also some shops and stalls in shopping centers where you can haggle for the discounted price, bargain hunters will be enjoying shopping in Thai markets for the most affordable goods. Shopping malls like Gaysorn, Siam Paragon, & Emporium are popular for tourists looking for international brands and world’s top quality designer wear. They are mostly open from 10am-10pm daily. These shopping centers are very accessible via (BTS), the city’s most efficient modern sky train. Tip: Tourist can apply for a “Tourist Discount Card” on the information desk for a 5% discount on most purchases. The newly-renovated Central World is officially the biggest and one of the best shopping center in Southeast Asia. With 500 stores, dining choices composed of 50 restaurants, 21 big cinemas with modern facilities, bowling hall, Kids’ Zone and Learning Centre, food court and two anchor department stores, Central World indeed is a one-stop-shop for fun, shopping and entertainment. What more could you ask for? Known as Bangkok’s pioneer shopping center, MBK a combination of a market and a mall. It is very popular among tourists and even locals. You can find both original and counterfeit goods here at bargain-friendly prices. With its 2,000 shops that sell almost anything under the sun, this place can get very crowded and busy especially during the weekend. Tip: If you’re a tourist, you can apply a Discount Card at the information on the 1st and 2nd level just don’t forget to bring with you your passport. It would also be best to take care of all your personal belongings while shopping—beware of pickpockets. Known as IT Mall, this a haven for the tech-savvy, where gadgets, electronics, and software abound. If you’re looking for a new wireless mouse, laptop USB stick, CD-rom drive, or the newest gadget to hit town, you can compare prices among as many vendors to find the best deal! DVDs, CDs, and software are also sold in this mall but be careful with buying pirated copies, which is very rampant in this center. Just remember that if you want the best deal for originals, go to shops on the top floors as they are the most reliable places for your purchase. Location: Petchaburi Road close to the trendy Amari Watergate Hotel and Baiyoke Market. Just across the street from Platinum’s (Pratunam) City Complex. BTS: Ratchathewi station and you can hire a taxi or tuk-tuk, or just walk ten minutes down Petchaburi Road. Wanna buy the latest fashion finds by the bulk? Platinum specializes in selling wholesale clothing, selling a similar range of clothing to the Pratunam Market across the street, except that it’s air-conditioned. This relatively new shopping center is in the Petchaburi area just a walking distance to Pantip Plaza. It’s a six-storey mall that’s filled with outlets housing the latest trends in clothing, footwear, and fashion accessories. Until now Siam Discovery is still a favorite among Bangkok’s younger and fashionable set. Situated just the opposite of Siam Square, this mall is packed up with good selection of shops, restaurants and designer fashion outlets. The Cinema complex is located at the top floor to cater to movie buffs. And for those in search of a coffee treat and good pastries, head over to Starbucks and Au Bon Pain at the ground level. This is a two-tower place with one leading to The Conrad Hotel. The many different selections of stores comprise the “All Seasons Retail Center”. The actual retail space is absolutely large and occupies all of its four levels. This place also houses a health clinic, state of-the-art spa, postal and some banking services. Esplanade was envisioned by the same Paris-based architects who designed Bangkok’s famous Emporium and Siam Paragon. It has a music academy, 12-theatre Cineplex, and ice skating rink. It also features one of the most modern auditoriums in the city. The “now showing” screens in these Cineplex movie theatres are all in digital format, replacing printed movie posters. Constructed in 1976, Siam Center is now considered as one of the oldest malls in Bangkok. Located in the midst of what they call “battleground of the malls”, it is dwarfed by the newly-built bigger malls but still offer its own attractive range of bargain finds. Famous the world over as the “mother of all markets”, over 15,000 different stalls covers all of its 35 acres with thousands of visitors every Saturday and Sunday. It’s one of the biggest and well-known shopping markets in the world. Don’t forget to wear your most comfortable shoes and bring along a bottle of water before you head over here. It’s not the easiest to navigate, but the excitement of discovering the best finds await you. Business Hour: 08:00 – 18:00 on weekends and Fridays (wholesale day). Plant shops are open Wednesdays and Thursdays too from 07:00 – 18:00. To get there: Just take the skytrain (BTS) to Mo Chit station. Just a five-minute walk, and you’re there. Patpont Night Market is the best place where you can choose from a wide range selection of fake goods; watches, clothes, bags and etc. This famous night spot with bars on either side has a lot to offer, and those with good haggling prowess can definitely benefit from the good bargains! To get there: From the BTS Siam station, go to Sala Daeng station. The vendors along the sidewalk will serve as your guide to lead you to the market just in 5 minutes. This is a great alternative in visiting the Patpong Night Market. It’s more organized, has good quality entertainment, food stalls and sells everything you’d look for. This place opens around 6pm and closes around midnight. Shop, eat and enjoy entertainment from live bands. It’s just a taxi ride away from the Silom road which is next to Lumpini Park. To get there: Take the MRT subway to Lumpini station. The market is very close to Lumpini Park just a short walk from the station.